I love the cranberry walnut combination. This week I have made cranberry walnut granola with yogurt and blackberries, salad with cranberry, walnut and Gorgonzola, and in the mornings I top my cereal with cranberries and walnuts. 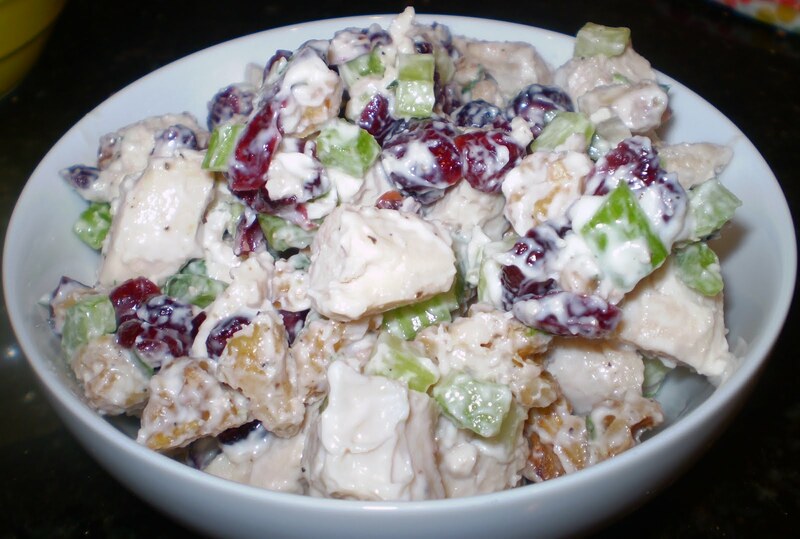 I then had a craving for chicken salad, so I threw in more cranberries and walnuts. I went all out with my chicken salad by brining the chicken breast to make sure it was nice and moist. Next time I might use a little less mayonnaise. I was really in the mood for a creamy deli-style chicken salad, but it probably was not the best decision health wise. Brent and I enjoyed this chicken salad both in a wrap, and on its own. It has a great variation of textures and flavors, and has become a Lowry lunch favorite. Combine all ingredients in a medium size bowl. Mix well. Adapted (barely) from Smitten Kitchen. looks good, but dried cherries are better!